Starting this Fall, GUWellness is interviewing employees about the ways they integrate well-being into their daily lives in our wellness@ Work series. First up is John Hooth, an athlete and a Payroll Partner in the Department of Payroll Services. He’s been with Georgetown University for eight years. John smiles for the camera while sporting his silver medal. GUWellness: You did something special this summer – tell us about it! John Hooth: I participated in the Gay Games 9 in Ohio. This is an international, multi-sport event and cultural gathering for LGBT athletes, artists and musicians. This was my first time at the games. GU:What events did you participate in? JH: The 100- and 200-meter dash, plus the 4×100-, 4×200-, and 4×400-meter relays. GU: How did you do? JH: My team took home the Silver Medal in 4×100-meter relay! GU: What about the experience challenged you? JH: It was challenging to build trust among people I’d never met before. Since I didn’t belong to a running or track and field club, I went on to message boards for the Games to find others interested in forming a team. 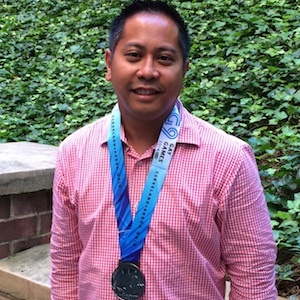 I joined a relay team with three other men from different parts of the U.S.. The first time we had ever met as a group was at the games and we instantly formed a bond. It was like we had known each other for ten years! GU: What’s one of your favorite memories? JH: Watching 99-year old, Ida Keeling, run and set a record in the 100-meter dash in her age category (95-99). She had come to the games with her daughter, who was also a runner and a competitor in the 65-69 age group. Her daughter had encouraged her to get into running after the tragic death of Ida’s two sons. At age 88, running became an outlet for her and helped her to deal with the loss. 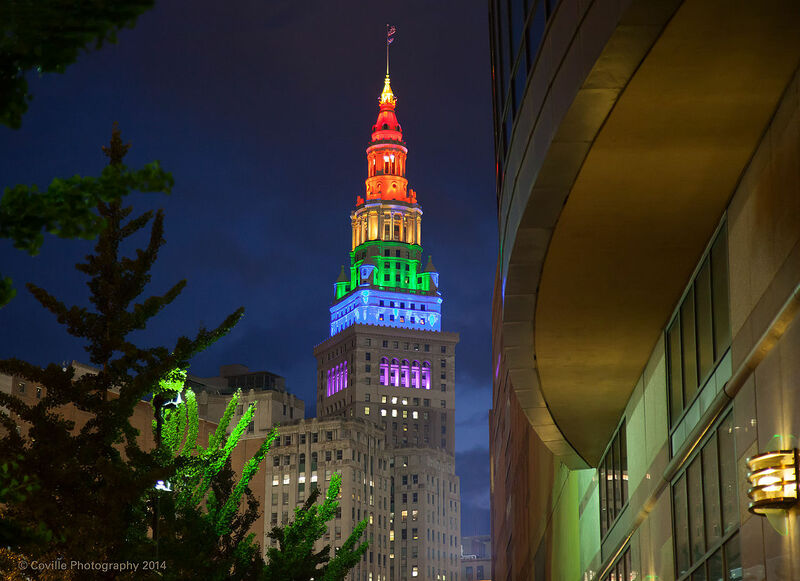 The Terminal Tower in Cleaveland, OH lit up in rainbow colors in honor of the Gay Games 9. Image via Wikipedia Commons. GU: What did you learn from your experience? JH: That, regardless of age, race or sexual orientation, if you work hard the results will come to you. I also learned to enjoy myself no matter whether I win or lose the race. GU: How will you carry this experience forward into your everyday life and work? JH: Knowing how important trust is in a team environment – and knowing that, together, you can accomplish great things. This applies on the track but also in the workplace. JH: I’m currently training for the next Games which will be in Paris in 2018. I have formed a track club with the members of my relay team and we’ll be competing in track meets together throughout the U.S. and at the Euro Games in 2015. GU: What do you do to “be well”? JH: I try to stay active. I love to do things outdoors. I go the gym, train for track and play flag football. I’m currently participating in the DCGFFL, DC’s only gay flag football league, but it’s open to everybody, which is nice! Are you a Georgetown employee with a wellness story to tell? Send an email to wellness@georgetown.edu with a short introduction and we’ll set up an interview!